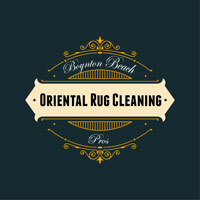 At Boynton Beach Oriental Rug Cleaning Pros, we specialize in cleaning, repairing and restoring your oriental rug in Boca Raton, Florida and the surrounding areas. Our top priority is to give our valued customers a hassle-free, efficient service. Our experienced staff has all the skills and tools necessary to give your cherished rugs the best treatment available. Oriental rugs are heavy textiles known for their intricate design—their original weaver used a variety of organic materials to create a striking and symbolic image. The brilliance of these rugs lies in their ability to brighten up your living space and seamlessly pull together the decor. Oriental rugs can be extremely delicate, however, and must be cared for and maintained constantly. Here are some steps that you can take to increase the lifespan of your Oriental rug and safeguard it for generations to come. Following our advice can help your designer rugs withstand the test of time and dramatically decrease the cost of maintaining them, although you will still need professional assistance to truly keep the rug pristine condition. First, try rotating your rug every other month. This reduces the depth of the dents caused by furniture or other objects placed on it. Hand-knotted wool rugs are great for the winter as they keep you warm and cozy through the freezing temperatures, but there isn't as much use for them in the summer. To reduce the wear and tear on your rug, we recommend you try putting it in storage during the warmer months of the year. Keep the rug away from direct sunlight, as the harsh UV rays can cause the rug to discolor. We would also advise you to hire our professional rug cleaning services at least once a year. Regularly maintaining your designer rugs reduces the amount of grit and grime that accumulates between the fibers of the rug. Caring for Oriental rugs is complicated, but it's a task that our well-trained staff is fully equipped for. At Boynton Beach Oriental Rug Cleaning Pros, we have worked hard to create a process that ensures each and every millimeter of the hand-woven material will be made spotless. Our servicing technique always starts with a patch test that keeps the darker colors from running into the lighter ones—we also use a specific mix of cleaning agents that are designed to clean and not ruin these luxurious rugs. Furthermore, we are equipped to restore, re-pad and repair your precious Oriental rugs, extending their life by getting rid of all those loose threads, awful smells and ingrained stains. We can even revive the color in your rug, a process that can be incredibly convenient if a small dull patch is ruining the entire design. 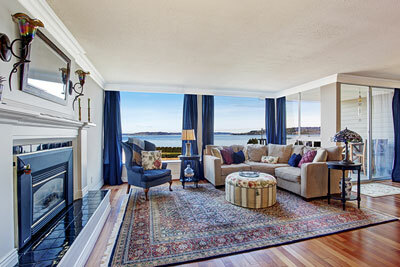 ​You may be wondering what constitutes an Oriental rug, and whether you really have one in your procession. The term usually applies to any heavy textile made in Asia, more specifically in countries such as India, China, Vietnam, Turkey and Iran. Your designer rugs can be made by hand or machine, though handmade rug are typically higher priced due to the effort it takes to make them. The kind of material used while making it. The quality of that material. The techniques used to create the rug. These factors won't affect our ability to care for and clean your Oriental rugs; however, the answers to these questions will affect the processes and equipment that we use while doing so, giving us the optimal cleaning method in every scenario. Successfully cleaning Oriental rugs means striking a balance between both a thorough and gentle process. Your rug will need a deep clean, but the methods used cannot be too harsh or else they will spoil the design. This is why it’s important to hire a reputable, professional service to clean your extremely valuable rug—in this business, there is no room for mistakes. Removing all the stains ingrained in the delicate material of your tribal rug. 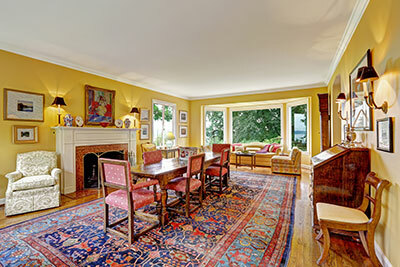 Giving your antique rugs a must deserved touch-up. Knocking that awful musky odor out of your Indian rugs. Adding an extra layer of protection to your antique rugs by coating the fibers with a special water and stain repellant. Ensuring that the color doesn't run and spoil the integrity of your Oriental rug. All of our cleaning services are meticulous and comprehensive. We also try to use environmentally friendly, non-toxic techniques and solutions even when cleaning the dirtiest of rugs to ensure that they are safe for household pets and small children.